We are going to be compiling several top ten lists in the next couple of weeks. First up is the bedroom. When I was in college Charlotte Moss visited campus and gave several lectures. She was one of the highlights of my time in school. One thing she said really resonated with me. She said (I’m paraphrasing) that if the master bedroom isn’t the first room you decorate in your home your marriage is in trouble. If you put your marriage first in your life it should be first on your decorating list. So that is why it is our first top ten (eleven in this case because it is just too hard to narrow it down) list. (She also said that king sized beds ruin marriages) These are our current favorites because our inspiration files are always growing and evolving. In my mind Thomas Pheasant can do no wrong which is why he tops the list. The ceiling treatment is to die for and the upholstered walls add to the cozy feeling of the space. I used to dislike windows flanking the bed but this photo changed everything. 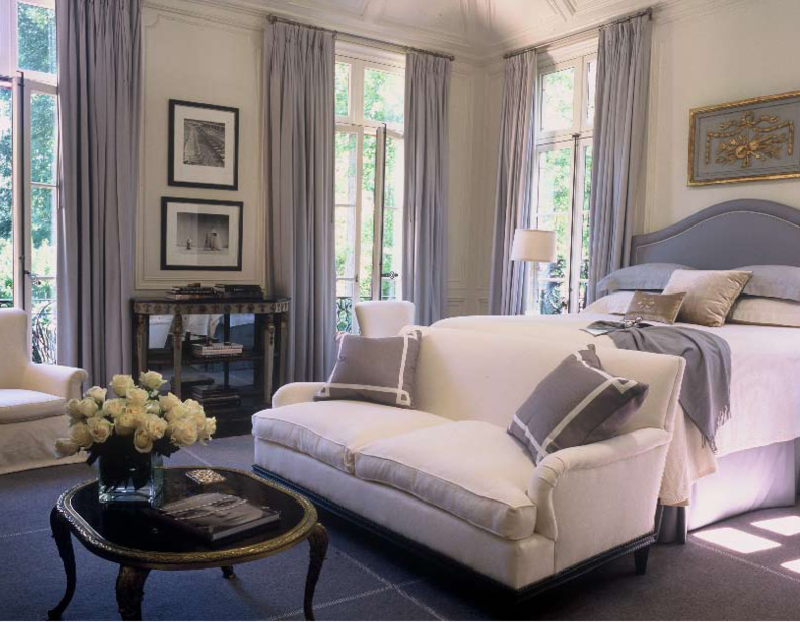 The way the drapery panels flank the bed creates such a cozy and luxurious space. Again, love the ceiling detail (I’m a sucker for ceilings). This room is a bit more contemporary but still feels cozy and restful. The homeowner said that purple is his neutral. I would never have thought of purple in that way but this room is a great example. 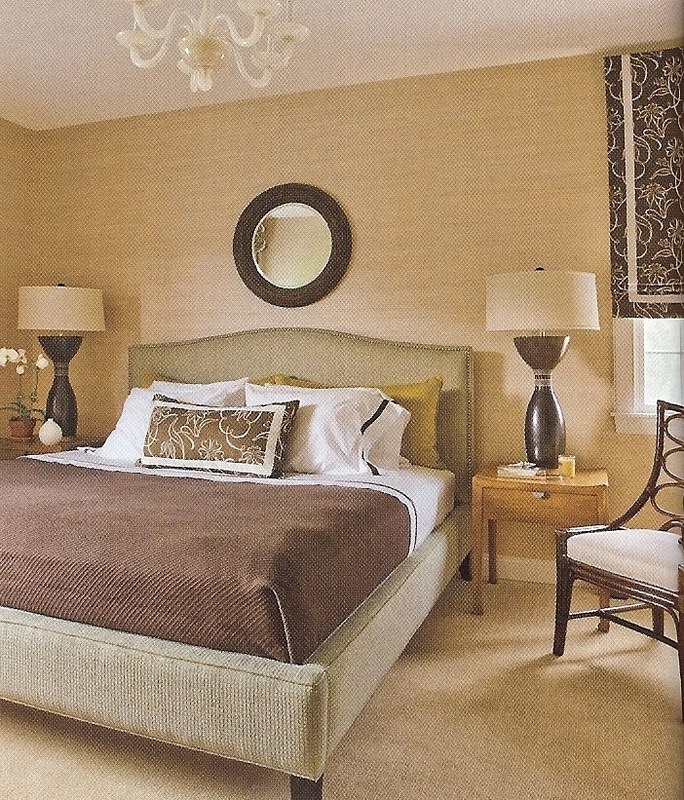 Notice the upholstered headboard theme we have going throughout the list. I’m a bit obsessed with them. 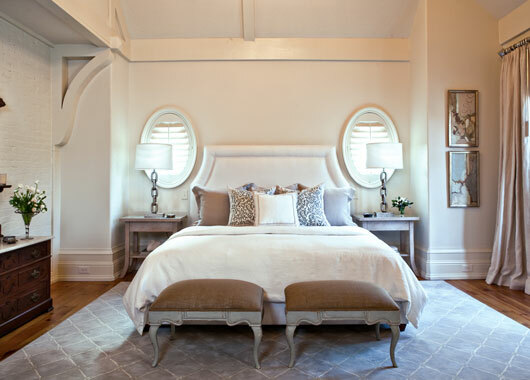 I’m completely in love with the oval window flanking the bed and the way the upholstered headboard follows the curve. This bed makes you want to just jump right in. I also love the low slung tie backs on the curtains. So luxurious without being too stuffy. 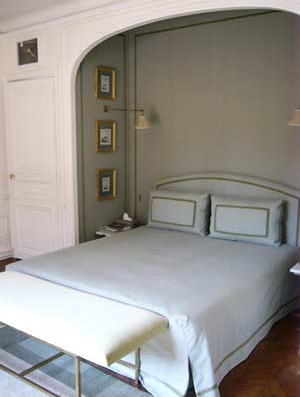 Another room which contributed to my new found love of windows flanking the bed. 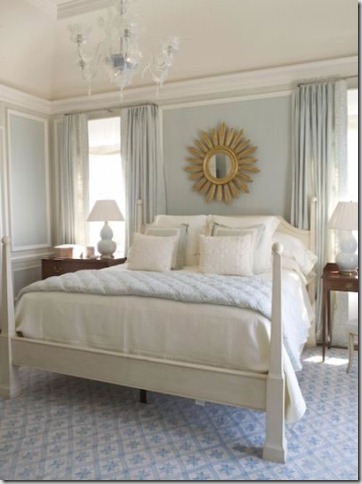 I find the cool color scheme so restful and relaxing. This one is much more masculine but still a great design. I’m loving the cameos. This one is a bit more contemporary without feeling cold. The grasscloth wallcovering is fabulous and I’m loving the graphic floral print on the roman shade. Most people think putting a bed in front of a window is a big no no, but I think photo is a great example of how great it can be. 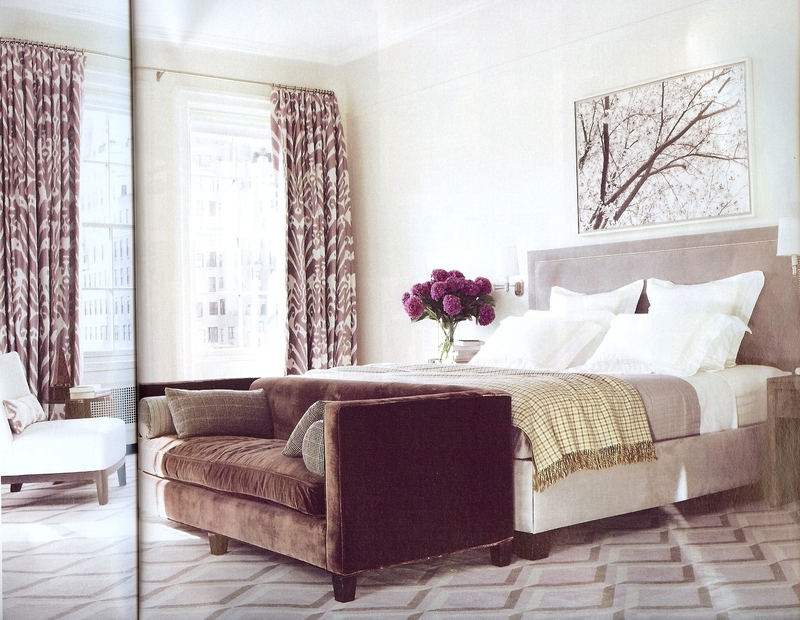 Again, the drapery flanking the bed is so luxurious and I love that they paired the floral print with sheer romans. 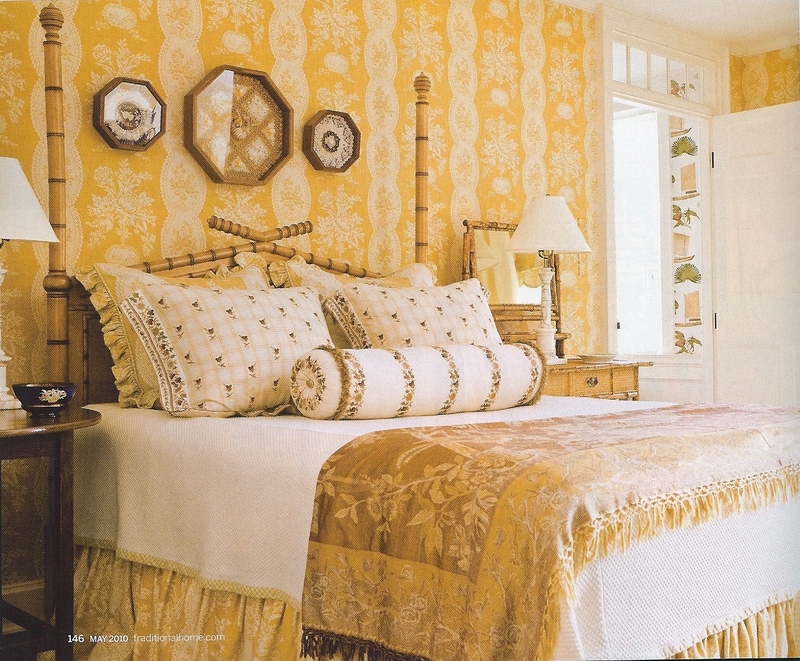 I’m also loving the pops of yellow throughout the room. 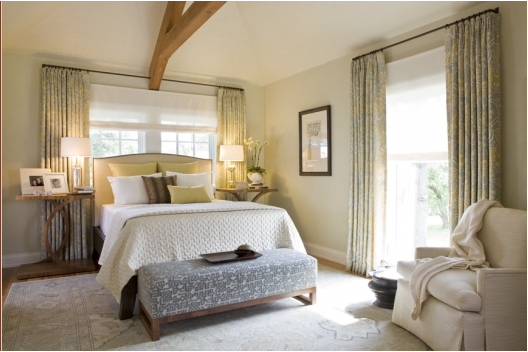 They add interest while keeping the overall color scheme muted and restful. This room is quite a bit different from the others but there is something about it that grabs me. It reminds me of a cozy cottage in the country. It’s bright and busy but still feels cozy. 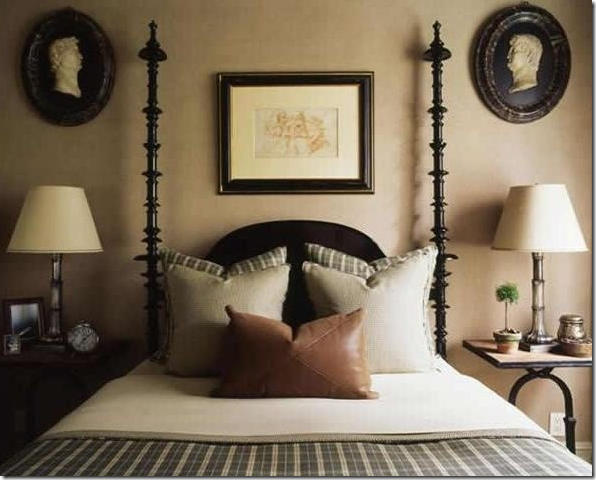 I love how the bed is tucked into the upholstered niche. It creates a little cocoon to cuddle up in. There you have it. Eleven of our favorite bedrooms (at least until next months magazines come out and we have to add to the list). Which one is your favorite? This entry was posted in Top Ten List. Bookmark the permalink. To me that first bedroom is exquisite!!!!!!!!!! I enlarged each photo to really get the details. I do love the “masculine” loked one too though, I love the colors! Just found your blog so will now be a follower!